Newmarket Racecourses is very pleased to announce the return of the Hacks Class on Saturday, 19th August, open exclusively to Newmarket based trainers. The trainer’s Hack can often be overlooked in a yard of magnificent racehorses when in fact they play an integral part of day to day life for many racing stables as a the trusty steed for the trainer or an assistant. Ranging from thoroughbred to cob, Hacks come in all shapes, sizes and personalities, some of which make them unique and at times, infamous! Papineau, 2004 Ascot Gold Cup Winner is one of the contestants who will be lining up in the Hacks Class on Saturday. 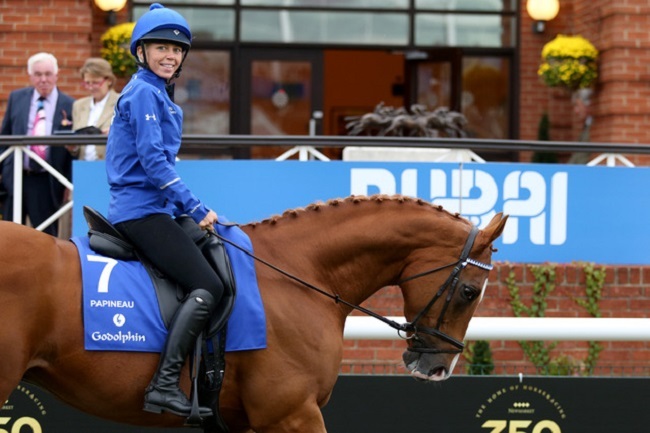 The Hacks Class will take place at 12.45pm in the Parade Ring at Newmarket’s Adnams July Course and will be judged by Tattersalls Chairman, Edmond Mahony, a regular judge of the Working Hunter show ring circuit. Kind sponsors, Retraining of Racehorses (RoR) and Suffolk based equestrian and shooting shop Forelock & Load, have provided prizes for the Champion, Reserve Champion, third, fourth and grooms, as well as Forelock & Load also kindly providing the Best Turned Out with a special prize too. This free to enter class will include two elements, one ridden and another in hand, and all Hacks will be partnered with either their Trainer or a member of the yard’s team. All riders taking part will have to adhere to standard showing dress code, including a jacket, tie or stock and also light coloured breeches. “We are delighted to see the return of the Hacks Class at Newmarket and to be a sponsor of the event. At RoR our aim is to showcase the breadth of options open for former racehorses when they finish their racing career. While some maybe retrained and compete in eventing or dressage, being a reliable hack for a trainer is just as worthwhile a second career and provides another example of how adaptable and intelligent thoroughbreds can be”.